Take progress monitoring to the next level. Capture, analyze, and report on student progress seamlessly. Enable data-based progress monitoring. AcceliPROGRESS allows providers and teachers to track progress against IEP therapy and academic goals and objectives when documenting services in AcceliTRACK,​ including the tools, strategies and assistance levels used to work toward each goal. The system then aggregates the data into detailed progress reports, providing insight into student outcomes and best practices for student services. 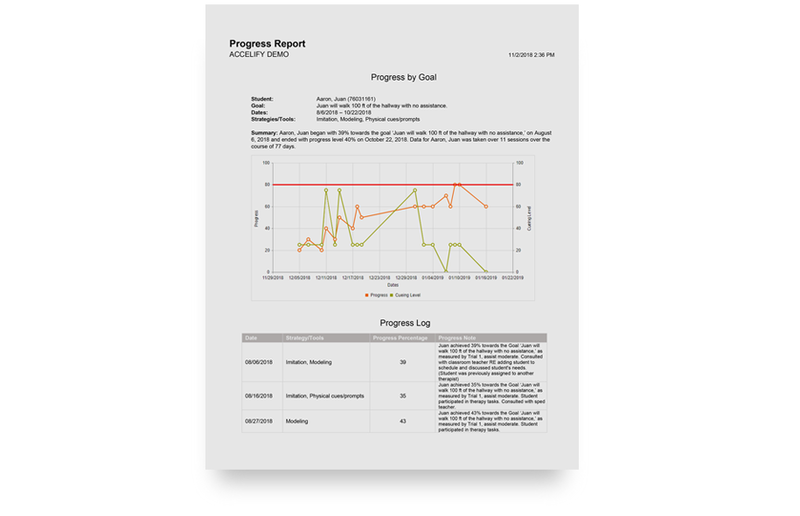 AcceliPROGRESS makes tracking progress against IEP goals easy. 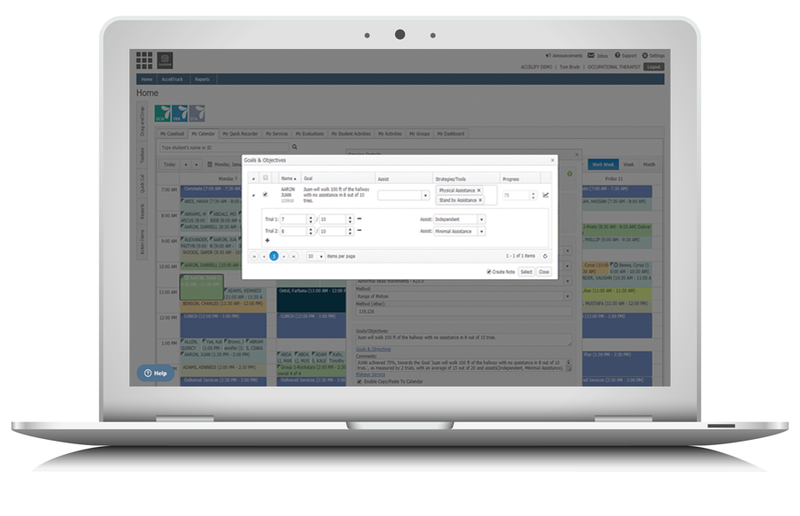 Providers and teachers can document raw progress percentages against therapy and academic goals or simply document trial data and AcceliPROGRESS automatically calculates the progress percentage and generates a progress note using the trial data entered. Analyze student progress with detailed progress reports. Easily view, chart and report on student progress. With AcceliPROGRESS, you can instantly generate progress reports on student goals, which graph the level of progress, assistance provided, all strategies and tools used to achieve the progress, and detailed service notes from each service provided. Determine what’s working and what’s not. Ensure students’ plans of care meet their needs throughout the course of their IEP and implement best practices to make the greatest impact on student outcomes. 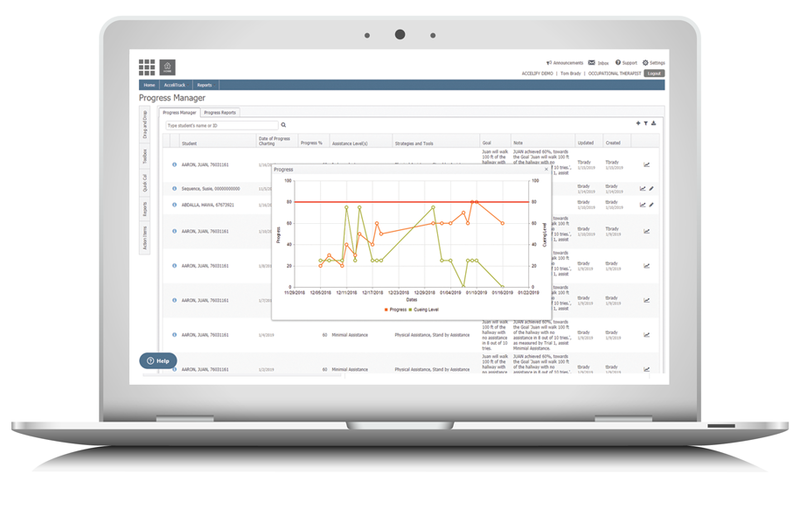 AcceliPROGRESS provides real-time visibility into which methods, tools, and strategies are most effective. If students have met or are failing to meet their goals, you’ll know before their next IEP meeting, so you can revise their IEP and adjust their goals to ensure the most appropriate treatment plan going forward.